No matter how well you take care of your roof, roof repair in Lake Oswego will be a necessity at one point or another. Time, the elements, and accidents can all cause the need for roof repair. Depending on your roof type it may have an expected lifespan of 10 – 45 years. Getting professional repair from the local experts at Pioneer Roofers can greatly extend the life your roof, saving you money and further damage. There are a variety of common roofing problems that many homeowners face. Failing to address these with timely roofing repair can result in further damage that can extend beyond the roof itself. There are a a number of things that set our roof repair in Lake Oswego apart from the competition. Why get professional roof repairs? Experience – We have over 20 years of experience working on roofs in the Northwest. We’re intimately familiar with the problems most often encountered by property owners. This includes windstorm damage, water damage, and hazard damage. Our skilled roofers offer emergency roofing and can quickly prioritize in a crisis. This ensures progressive damage sources like water are dealt with quickly, hazards are eliminated, and work is begun as soon as possible. Knowledge – With extensive and continual training our roofers can diagnose a roof problem quickly and accurately. The first step when performing roof repair in Lake Oswego is a diagnosis. In time sensitive situations it’s important that your roof repair company in Lake Oswego knows how to analyze and respond. This skill is developed through training and on-site responding. We only employ the best local roofers, so you get the best local roof repair. Equipment – From the tools we work with to the materials we buy, everything we use is of the highest quality. We need equipment we can trust, and you need to know your roof repair company comes fully equipped. Better equipment means accurate, reliable repair work. We also work closely with our parts supplier, maintaining high quality while providing excellent affordability. Your roof repair is only cost effective if it’s built to last, and building to last is the only way we know how. We work extensively with home and business owners, on every roof type in the Northwest. Whether you’ve got a pitched or flat roof, whether it’s a functional use space, no matter what material it’s made out of, we can repair it. 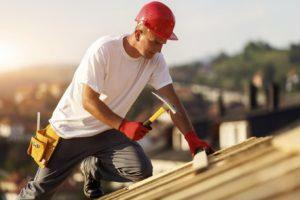 There’s no better time for roof repair in Lake Oswego than now. Don’t wait until damage necessitates a new roof or major restoration when our roofers can repair your roof to a pre-damaged state and significantly extend the life of your roof. For excellent service from a trusted, reliable, and efficient local roof repair company in Lake Oswego call (503) 969-7354 or Contact Us today.